Anyone who’s a fan of standing stones, mystery, or controversy should run (or drive) to investigate America’s Stonehenge, in Salem, NH. This sprawling installation—a mix of stones, henges (circular Bronze Age structures), Oracle Chamber, and purported Sacrificial Table—is ringed round with a labyrinth of twining stone walls that snake through wraith-like woods, raising as many questions as a mystic’s Ouiji board. Is it truly 4,000 years old? Who built it? What is its purpose? Will we ever know? In the end, the pictures tell as compelling a story as any oracle ever could. Here, and below, I’m including a handful of photos in sepia, imagining what visitors in the 19th century would have documented. Somehow the brownish tones seem to capture the mood and haunting essence of the place. With the Spring Equinox on its way, it’s as easy to imagine Colonial picnickers at this site as it is to picture Druids under a full moon, or Vikings, or Native Americans, tracing the sun as it wheels overhead, across a limitless sky and down over stones, casting shadows and scattering questions…. This entry was posted in A Desk with a View, Travel and tagged America's Stonehenge, Bronze Age, Druid, Eccentric New England travel, Henge, Mystery Hill, New Hampshire tourism, New Hampshire travel destinations, NH, Salem, Standing stone, Stonehenge. Bookmark the permalink. I went there on the Harmonic Convergence. Oh, I love this place!!! 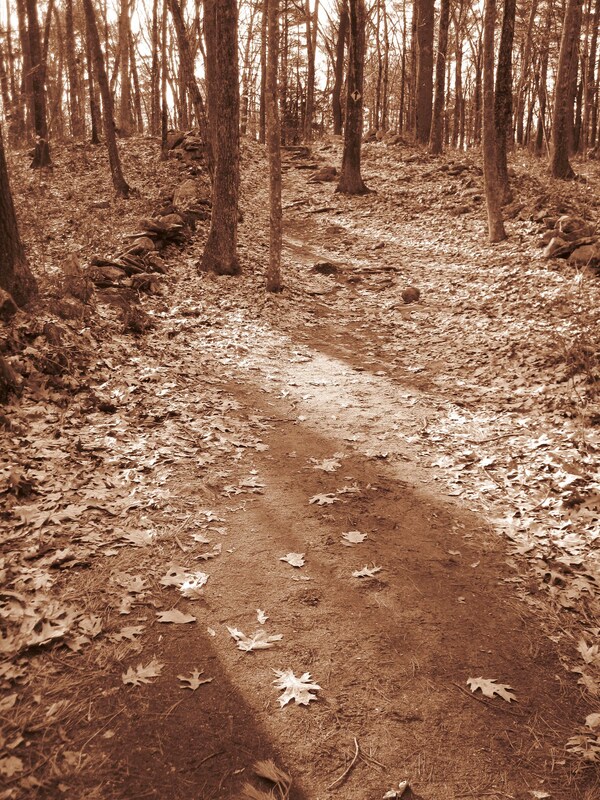 The photos bring me right back, and you’re right, the sepia tones are perfect for the mood. Very few know about our very own Stonehenge (thanks for defining “henge,” by the way), so thanks for bringing it to light!! !